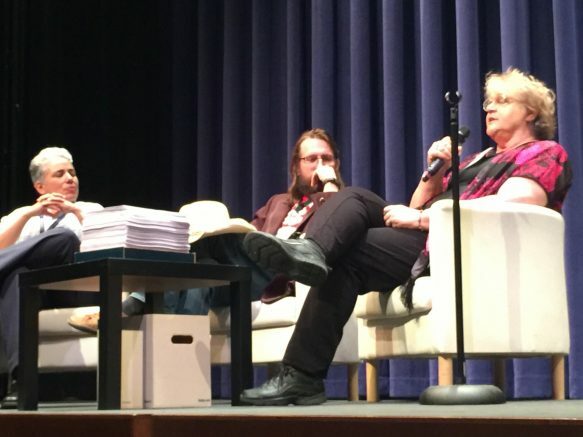 The annual SummerWords creative writing festival kicked off its fifth year with featured faculty writers Christian Kiefer, Lois Ann Abraham and Cathy Arellano reading from their published or upcoming work at American River College on Thursday. The festival began at the ARC theater with attendee registration and a catered opening reception. The opening reception allowed attendees and presenters alike to meet and mingle while they awaited the introduction and faculty reading event. ARC’s dean of the English department, Doug Herndon, welcomed participants to SummerWords at the beginning of the event. Herndon then brought out ARC creative writing professor Traci Gourdine, who introduced Arellano, the night’s first reader. Arellano, Abraham and Kiefer read to a theater full of current and former ARC students, staff and faculty as well as members of the community. Gourdine introduced Abraham by remarking upon Abraham’s wit. “Her wit is insightful, and she brings it to the page so well. I wish I had the opportunity to be one of her students,” said Gourdine. Abraham’s reading went over time, as Kiefer and the crowd encouraged her to continue for an additional chapter. Former ARC student Joshua Jonas said that he was “blown away” by Abraham’s reading. Kiefer wears many hats — alongside his job as an ARC professor, he is a Pushcart Prize winning author, musician and father. Kiefer began his reading by announcing that he had finished his novel. 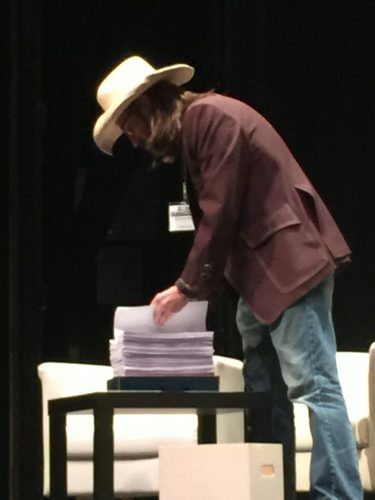 He then emptied a cardboard box onto a table, revealing a stack of hundreds of printed pages. Following the readings, Kiefer, Arellano and Abraham hosted a question and answer panel and fielded questions from the audience. Arellano answered a question from an audience member regarding the reaction of her friends and family when they read work that is about them. Abraham fielded a question about doing research for her books, and she cited Google as one of her most powerful tools. “I tend to have protagonists who are clueless, and it saves a lot of work,” Abraham said. When Kiefer was asked about the impact of editors, readers and collaborators on his work, he said that the current draft of “Kingdom of Wolves” is draft 39C, and that readers both help him improve his work and help him to feel good about it. ARC English major Maurina Robinson said she enjoyed Kiefer’s reading. “Kiefer writes the kind of books I love to read, as a writer and a reader,” Robinson said. Jonas said that he is very excited for the rest of the festival. The festival will continue tomorrow at 9:15 a.m. with a morning reception in the Student Center lobby. The rest of the day will consist of four one hour and 15 minute workshop blocks followed by evening readings at 5:15 p.m. from authors David Dominguez, Bich Minh Nguyen and Josh Weil. Be the first to comment on "Faculty readings kick off the first day of SummerWords"